Stop Line 9 | Advocating for sustainability and environmental justice. One way to fight climate change and ongoing unsustainable fossil fuel extraction is to halt the reckless expansion of the Alberta tar sands. This can be achieved by protecting the land, air and water from pipelines that the Harper government and industry need to ship oil out to foreign markets. 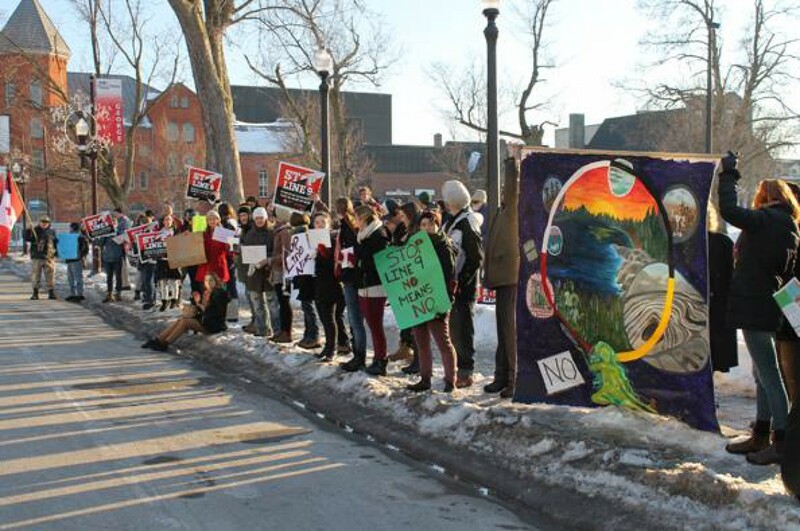 Sustainable Trent has been an integral part of local and national organizing efforts to oppose Enbridge Inc.’s Line 9B Reversal & Line 9 Capacity Expansion Project. Line 9 is an existing 39 year old pipeline which runs from Montreal to Sarnia; Enbridge has applied to the National Energy Board to increase the capacity of the pipeline from 240 000 to 300 000 barrels of oil per day, for the ability transport heavy crude oil from the tar sands, and to reverse the direction of flow so that oil can be pumped from Sarnia to Montreal. The oil can then be refined on the east coast and exported to the US or Europe. Line 9 runs through 18 First Nation communities who have not been adequately consulted about the project, and who have not given their consent for this project to take place on their land and traditional territories. The pipeline has already passed its expiry date and was not built to transport diluted bitumen (tar sands oil), which is heavier and more corrosive than conventional crude. This makes the risk of a disastrous oil spill extremely high, and Line 9 runs through the most populated area of Canada and just north of Lake Ontario, the source of drinking water for millions of people. 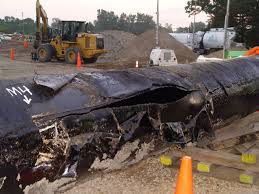 Ruptured Enbridge pipeline that spilled over 1 million gallons of heavy crude oil into the Kalamazoo River in 2010. Clean-up continues to this day, with costs over $1 billion. 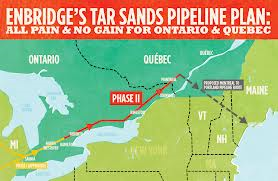 If Line 9 is approved, it will lead to increased carbon emissions, violation of Indigenous and aboriginal treaty rights, further entrenched dependency on oil, and high risk of destructive and costly oil spills. What have we been doing to stop this risky and destructive project that puts the land, air and water at risk? Sustainable Trent has been a strong supporter of the Peterborough Coalition Against Line 9, a collective of local organizers who held educational and action-oriented events about Line 9 in the Nogojiwanong community. We provided funds for the printing of hundreds of “Stop Line 9” stickers, which were distributed throughout Trent and Nogojiwanong. We also provided funding for a free bus from Nogojiwanong to Toronto for the No Line 9! No Tar Sands Pipelines! march and rally outside the National Energy Board hearings. We also successfully applied for Intervenor Status in the National Energy Board hearings on the Line 9B Reversal and Line 9 Capacity Expansion Project. This process lasted from April to October 2013, and including submitting written evidence, maintaining contact with other Intervenors, and presenting final oral argument at the hearings themselves, which took place from October 16-19 in Toronto. The National Energy Board process was undemocratic, because it required a 10-page application submitted 6 months in advance just to participate, whether by writing a letter of comment or becoming an official Intervenor. Applicants also had to prove they were “directly affected” by the Line 9 project, a requirement that was very limited by the fact that participants could not discuss the impacts of climate change or the tar sands mega-project. We decided to challenge the Line 9 project through this flawed process in addition to protests and community outreach. At the hearings, we spoke out strongly against the project, arguing that the integrity of the aging pipeline is too poor to transport oil and especially tar sands oil, the risks and costs of a spill are too great, and that Line 9 violates Indigenous inherent and treaty rights to the land. To approve Line 9 would be to violate Canada’s constitution, which states that aboriginal rights must be honoured and protected. The National Energy Board is expected to announce its decision on whether to reject or approve Line 9 in early 2014. The federal Cabinet will then give their own ruling on the NEB decision. If Line 9 is approved by the NEB, stay tuned for local actions in ongoing opposition to this destructive project. We can create a world without dependence on oil, and without human rights violations. STOP LINE 9! !